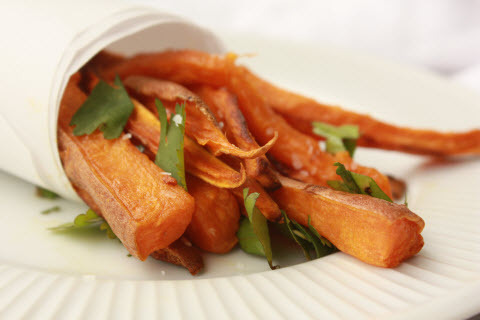 We have been obsessed with Sweet Potato Fries as of late. We may be single handedly keeping the Sweet Potato farmers association afloat. Previously, I was not a Sweet Potato fan. I endured them. However, I have had a change of heart! These fries are delicious and so incredibly simple to make. I recommend serving them with a little spicy barbeque to offset the sweet flavor that is inherent in these gorgeous little Sweet Potato Fries. Preheat oven to 350°. On a baking sheet lined with a non-stick baking mat toss fries and a drizzle of olive oil (use sparingly or they won’t crisp up). Arrange fries in a single layer. Dust with salt, pepper and jalapeño powder. Bake for 20 minutes at 350°, flip once and continue to cook for up to 15 more minutes. Be careful not to let them burn….yes, learn from my mistake.